"Memorable choreography...best are stop-motion images of the dancers, which have a ghostly effect, as if the walls were movie screens for spotty memories of the dance...shifting, sculptural...strong." "As I watch the piece’s skillful unraveling, marked by a focus on the juxtaposition between projected and physical identity, it becomes clear that this work is going to be illuminating—revealing secrets about the body and perceptions of time through photography and movement." "Rebecca Stenn is a thrilling, hypnotic contemporary dancer and choreographer. Half-lit and shrouded in black, she moves tentatively like a shadow, governed by instinct, seemingly alert and cat-like as though ready to pounce. Fluid and ethereal, Stenn's movement echoes the half-world between sleep and consciousness." "Stenn moves with incredible softness in her upper body that rests so well against Alice Hwang’s live piano accompaniment of Chopin’s Nocturnes. Her movement with Charlie Chaplin footwork and bird-like wafting arms is animalistic, as Stenn as the first creature of the night plays alone in the quiet.The partnering sequences are particularly memorable, well-produced and executed. I wanted a ball-of-the-foot swivel partnered turn between Stenn and Pollard to go on forever." "'Fantasy'...was filled with movement - rippling swan arms, loping runs...beautiful...unveils a world of night creatures." "Stenn's performance was a splendid meshing of tender vulnerability and physical presence." "Stenn is a choreographer of generous vision...the evening offered one gem after another of visual and movement imagination...achingly beautiful…daring and successful." "Rebecca Stenn is one of the most gifted and innovative young dancer/choreographers in modern dance." 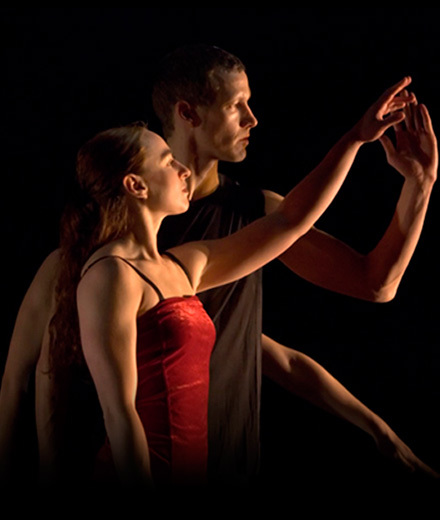 "A fresh, vital dance company in a remarkable debut by a stunning dancer/choreographer. Stenn's dancing is strong and passionate... she brings down the house." "Stenn's solo is compelling...and bassist Jay Weissman, performing live, creates a sophisticated atmosphere." "PerksDanceMusicTheatre captures your attention with astonishing technique, imagination, wit and charm. It's a terrific evening of theater." "Sophisticated...Rebecca Stenn is a creative force. Tenacious discipline and exacting work...Stenn's uniqueness is in her kinetics and brilliance of concept...a dancer of ability and imagination." "Captivating and consistently excellent, Stenn's choreography balances the sublime and beautiful with humor and thus involves the entire audience, whether dance afficionados or not. Her strength and beauty offer a unique dance experience that is filled with promise for the future." "Brilliant...stunning...visually exciting...Stenn shone in the inventiveness of her choreography." "Stenn's choreography is breathtaking...right on the money." "In her piece "The Carmen Suites," inspired by the Bizet opera, Rebecca Stenn and her PerksDanceMusicTheatre have reached a level few companies have...startlingly, tellingly. What Stenn has done is expand the Pilobolan-Momixian form to the point where every single "trick" or "gimmick" or prop promotes and instigates and ignites a pure dance."